U.S. Senator-elect Jacky Rosen speaks to a crowd at the University of Nevada, Reno while on the campaign trail. The 2018 Midterm Election is over, and it appears that Nevada saw a significant Blue Wave roll over the state. To talk about some of the results, KUNR’s Bree Zender spoke with Senior Political Reporter Paul Boger to breakdown the election. The Democrats' success was due, in large part, to voter turnout in Clark and Washoe Counties. 2018 was not a record-setting midterm election in terms of voter turnout. It was, however, a pretty decent middle of the road election. A crowd of all ages dedicated their night to waiting for resultsduring the Democratic watch party at the Reno Ballroom. Statewide turnout was around 62 percent. That's less than 2016 which saw 76 percent voter turnout, but more than 2014, which had an abysmal 45 percent. This year’s turn out was still less than the 2010 midterm. However, it may be important to note that there are roughly 400,000 more active voters in the state today. In Washoe County, those numbers are a bit higher than the state average which would explain why Washoe favored the Democrats so heavily. Victories in the high-profile races carried the day for down-ballot Democrats. In Nevada, the two biggest races on Tuesday’s ballot had different tones and represented two different views voters wanted for the state and nation. 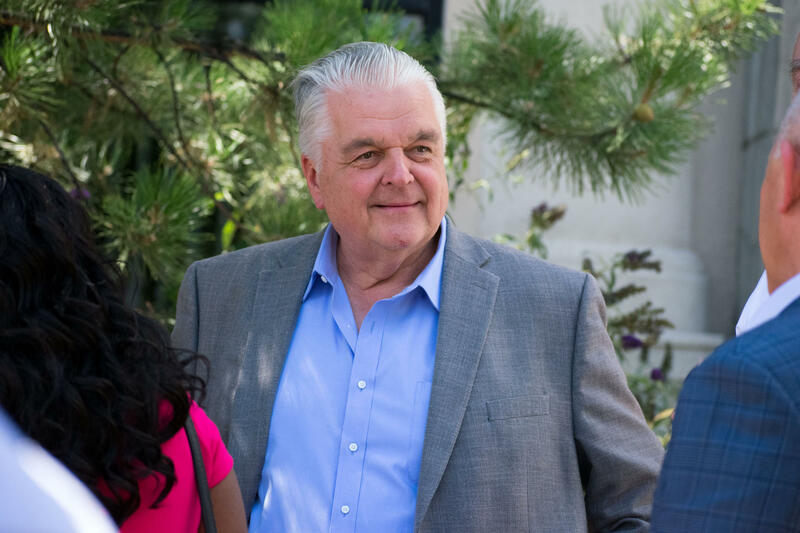 In the governor’s race, Sisolak really talked a lot about following in Brian Sandoval’s footsteps and building on his successes. Sandoval is still really popular, and that may have resonated with voters. Governor-elect Steve Sisolak, attending an event at UNR, will bethe next governor of Nevada. For the Senate race, Rosen really capitalized on her campaign as a referendum on, not only Dean Heller, but also the Trump administration. For example, Rosen really hammered Heller on his votes on repealing the Affordable Care Act and his ties to the president. Keeping that in mind, many of the down-ballot executive branch races were razor-thin for most of the night. It’s only been in the last couple hours that some of those races have opened up a little bit. Without the boost from those high profile races and heavy voter turnout, this very likely would not have happened. 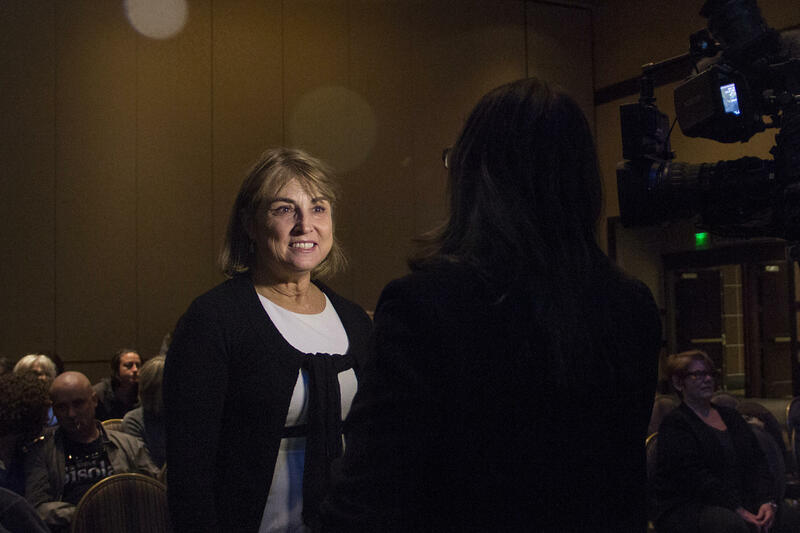 Kate Marshall speaks in front of the camera moments after shedelivered her victory speech for Nevada Lieutenant Governor. The only Republican to survive last night’s blue wave was Secretary of State Barbara Cegavske. She eeked out a very slim victory over challenger Nelson Araujo, seeming to buck a trend that claimed all of her GOP colleagues in constitutional offices. Democrats will maintain control of the Nevada Legislature. After June’s Primary, it appeared that Nevada could become the first state to elect a majority female legislature. That did not come to fruition, but Democrats were able to keep control of both chambers of the state legislature, securing their majority ahead of the 2019 session. 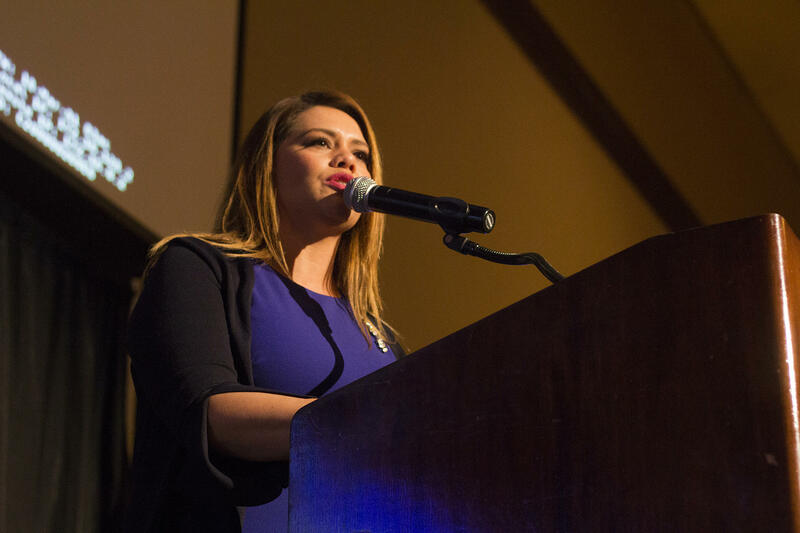 Teresa Benitez-Thompson spoke to attendees after she wonFloor Majority Leader for State Assembly District 27. That being said, the infamous brothel-owner-turned Republican politician, the late Dennis Hof, also won his election for Assembly District 36. The decision of who will replace him in the statehouse now heads to the Nye County Commission, who will likely name their replacement within the next few weeks. Voters were not willing to sign-off on energy choice initiative. Voters in Nevada approved five of the six initiatives on Tuesday’s ballot. The only statewide ballot measure that failed Tuesday, was Question Three, which asked voters whether they supported removing NV Energy’s status as a monopoly and opening the state’s electric market to competition. With the amount of money poured into the “No on 3” campaign, this shouldn’t be a surprise to too many people around the state. Also to its detriment, Question Three was both an incredibly dense, and often, a confusing measure. There were few individuals in the state able to effectively communicate what exactly would happen if voters in Nevada approved an energy retail market. Add that to fears of increased energy prices, and the uncertainty of the measure especially in rural, northern Nevada, the measure failed to pick up the steam it had in the previous election. Voters are in favor of the direction in which Washoe County is moving. With few exceptions, voters in Washoe County voted to keep the incumbents in both city and county offices. The most notable win was for Reno Mayor Hillary Schieve who beat her opponent, Businessman Eddie Lorton, by nearly 30 points. Throughout the election, Lorton criticized Schieve’s handling of several large issues facing Reno including the city’s handling of the homelessness and paying off municipal debt. 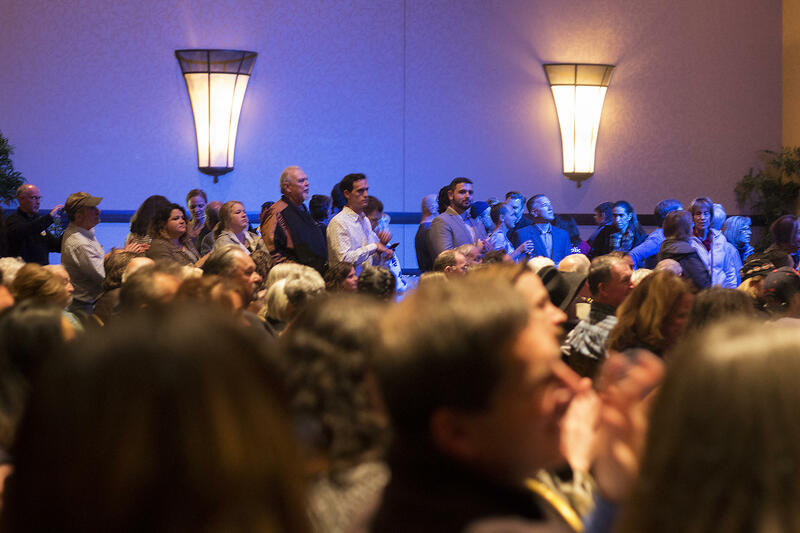 Despite the criticism, voters have overwhelmingly thrown their support behind Schieve, handing her one of the largest victories in Northern Nevada. Embattled Reno City Attorney Karl Hall also kept his seat despite a challenge from his predecessor, John Kadlic. Hall has come under fire in recent months for his handling of sexual misconduct suits made against the city by former municipal employees. Hall has also been criticized for hiring private investigators to examine Reno’s strip clubs as part of an effort to move the establishments out of the city's core. Nevada is not the only state that'll be holding major elections up and down the ballot. To the West, voters in California are also set to decide who will lead their state for the next four years. KUNR's Paul Boger spoke with Alexei Koseff, a political reporter at the Sacramento Bee, to get the latest on the some of the high profile campaigns there.